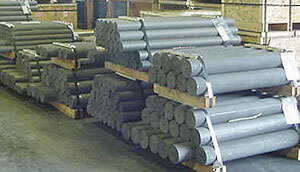 Graphite rods in stock ready for shipment. To insure ready availability for our customers, we maintain a substantial inventory of graphite and carbon rod and block in a wide range of standard sizes. Same day turnaround is available for most products. We also offer graphite and carbon rod and block in custom cut sizes to meet your needs. In addition, we can manufacture graphite and carbon to your exact specifications and formulations. At NAC, we are always working to develop new grades to meet the needs of our customers' applications. Cost-effective production methods and large volume runs allow us to provide our products at very favorable prices. All of us at NAC understand how important quality and on-time delivery are. Also, rush jobs are not a problem. If you need material today, call us. We will do everything possible to deliver what you need, and get you operating with minimum downtime. We can also private label products for you.